Home / Firewood tips and facts / Be Softwood Savvy! It may be that if you are the owner of a wood-burning stove, that you think you can only ever burn hardwood. Not true. When you think about it, most Scandinavian countries burn little else than softwood, the main reason for this being that these countries are surrounded by softwood forests and they use woodburning stoves instead of open fires. But apart from the fact that softwood is so plentiful, there are many good reasons for choosing this sustainable type of firewood and there are many advantages to burning it or mixing it with your hardwood. For owners of wood burning stoves, softwood logs can definitely save you money. An air dried metre bag costs just £65 compared with £85 for hardwood. They are great for lighting your fire because they burn so well and hot and once your fire is established can be alternated with hardwood for extra length of burn time. What also makes them great for woodburners is that you can use this cheaper firewood more liberally and continuously throughout the day, especially if your stove is connected to your central heating or hot water system. Soft woods will generate less heat per kilo, but should cost you less overall. Our Norway Spruce and Sitka softwood is grown right here on the farm and is seasoned for at least a year. This lightweight wood is typically resinous which allows the wood to light easily and burn hot and fast. A fire built from softwoods will usually have large flames that crackle and spark. Whilst proper seasoning reduces this sparking enormously, it is why they are much more suitable for wood burning stoves than open fires. They also work really well when mixed with hardwood to help freshen up a slow burning fire. One disadvantage of softwoods is that they leave behind fine ashes with little to no coals, as a result, softwoods are not good for overnight burning in a woodburning stove because the fire will probably be out in the morning with no hot coals left to restart it. Softwoods such as evergreen trees or conifers can be identified by their distinct needles and pine aroma. Softwoods grow very fast compared to most hardwoods resulting in a much lighter, less dense piece of wood and they season faster than hardwoods and light much easier making them the most popular choice for kindling too. It is important to know the difference between the two types of wood, hardwood fundamentally comes from deciduous trees that lose their leaves in winter, such as Oak, Ash, Beech and so on. They are slow growing and take between 80 to 100 years to mature and therefore provide a dense timber. In comparison, softwood grows much faster maturing in just 25 to 30 years and the timber is therefore less dense. This means that softwood is in much greater supply and is an extremely sustainable source of firewood. Lots of people say that you shouldn’t use softwood because it burns too fast, produces too much resin in the flue or smokes too much. Softwood is actually great for burning, but as with all wood it has to be dried properly to below 20% moisture content. Whilst it has the same calorific value as hardwood by weight, being less dense you do need up to twice as many logs for the same weight, or energy output. With regards resins, there is a lot of debate about this but it does seem that as long as the wood is dry the resins can actually help to supercharge and help the fuel. As for being extra smoky, just like any other type of wood, if it is not dried properly it will smoke. If you compare hardwood versus softwood, it’s the density of the wood that makes all the difference and pound for pound hardwoods and softwoods will create about the same amount of heat. That said, due to the difference in density, you may need twice the volume of softwood compared to the same weight of hardwood. 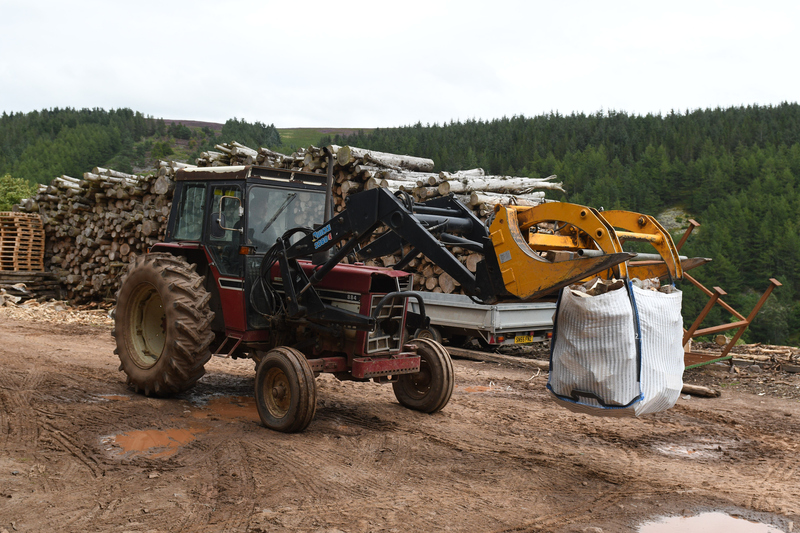 Of course, more volume means more logs and more stacking – this is why many people choose to burn hardwood over softwood if given the opportunity. However, if you look at the cost savings and the plentiful supply of this highly sustainable and easy to light and hot burning fuel, there is a very good case to be made for burning more softwood. As more and more people are installing woodburning stoves, more and more people are also getting more knowledgeable about the type of wood that they are burning and it does seem that we are starting to learn from our Scandinavian cousins! If you have a woodburning stove, why not try some softwood and you can experience the benefits for yourself this winter.